Who wants to be a billionaire? 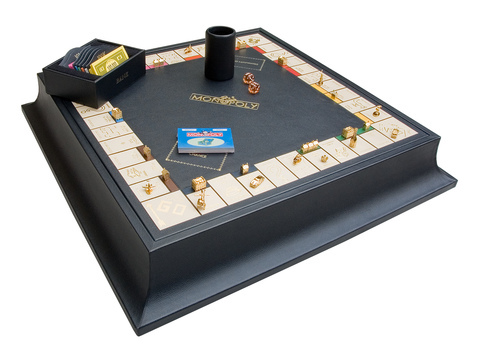 Living on easy street is as simple as rolling the dice with this "enhanced" Monopoly set. This beautifully conceived edition features: higher-valued standard properties, spaces intricately inlaid within a Dauphin calf leather frame, a scalloped sided plinth in matching leather, pair of leather-bound and suede-lined dice cup and a leather bank box. Available with a choice of pewter, sterling silver or solid 18ct gold playing pieces.